Humans have notably good vision, especially among mammals. We see more colors and in higher resolution than the average dog or deer. And of course, our forward-facing eyes give us depth perception, similar to hunters like lions or owls. But we’re not chasing down much colorful prey with our bare hands, so what was the initial advantage for our primate ancestors to develop better vision? The answer may not be what we were after, but what may have been after us. Multiple forms of evidence have been gathered that point to the need to avoid venomous snakes as a reason for our visual abilities, the most recent of which was a survey of snakes in chimpanzee country. Researchers spent four years documenting snakes they encountered in areas where chimpanzees live. 64% of the snake species encountered were venomous, and the researchers generally sense that their encounter rate is likely lower than what our ancestors would have faced. They also noted that their detection rate is likely lower than a group of chimps working together, just based on the number of eyes keeping watch alone. The Snake-Detection Theory (SDT) is built on more a lot of snakes though. Championed by anthropologist Lynne Isbell, the number of snakes in an area has been compared to the visual abilities of local primates, and they show a strong correlation. For instance, lemurs on Madagascar have the worst primate vision, but they have no venomous snakes to contend with. Primate brains provide more evidence for SDT. Neuroscientists looked at macaque monkeys, and found that their brain registered visual stimulus from snakes faster than to any other objects. 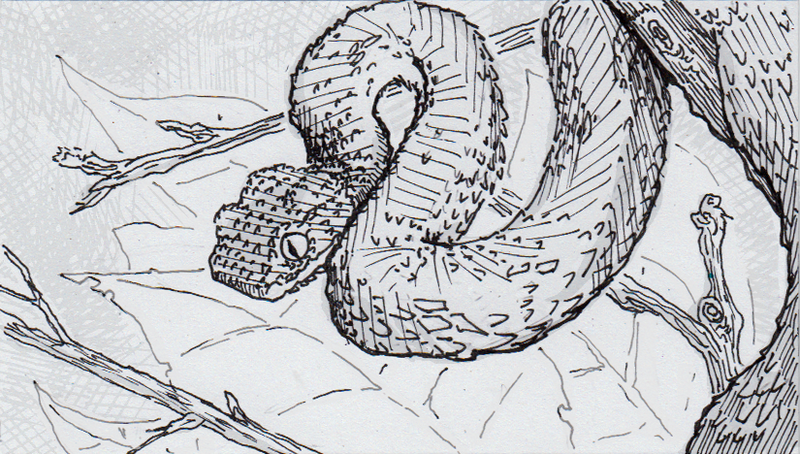 What’s more, that recognition was even faster if the snake was seen in a coiled, threatening posture. All together, this suggests that the need to quickly see the shape and color of a snake among the forest leaves, and then recognize it as a threat, was a significant advantage for our primate ancestors. Our visual capabilities have obviously bestowed other benefits since then, but a fear of serpents may have kicked it all off. My kindergartner says: Another experiment should be done with the macaque monkeys, wherein they are placed in a “tent” with pictures or projections of a real jungle inside it. An image or video of a snake would be hidden somewhere in that virtual jungle, and the test would be to see how quickly the monkey could pick the snake out of that scene. And there would be “a window so we could watch the monkey” of course.